Today's sophisticated cyber-criminals are finding new ways to plant their crimeware into business clients. Their stealthy viruses and codes are digging in out of sight and out of reach of virus detection and the operating system (OS).3rd generation Intel Core vPro processors' built-in security technologies deliver and protect business clients where current technologies cannot reach. 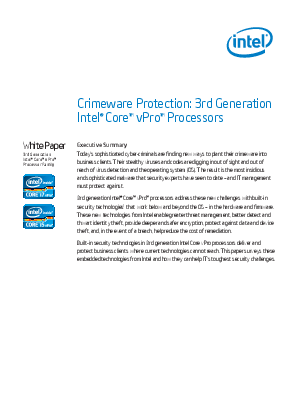 This paper surveys these embedded technologies from Intel and how they can help IT's toughest security challenges.